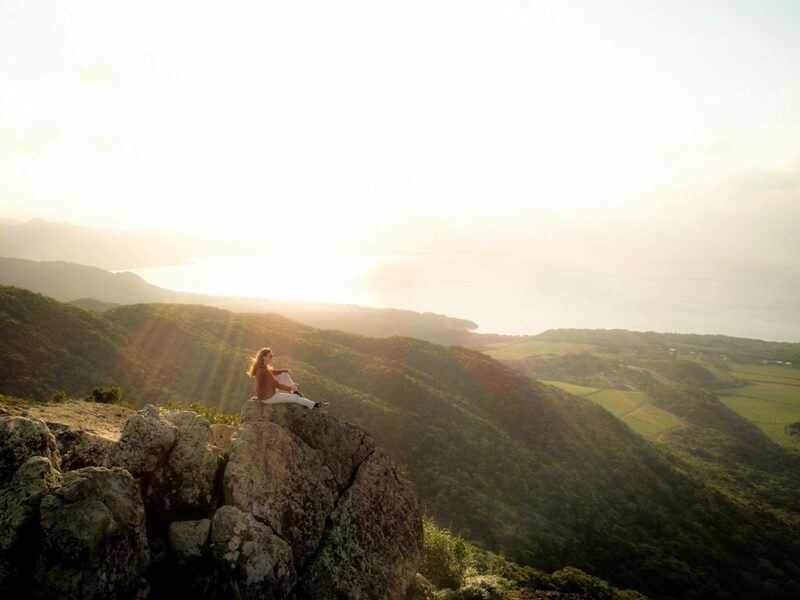 Our 5 personal favourite sightseeing spots in Ishigaki island. People who follow us along, know we like the hidden places. The secret spots, known by locals. And even if they’re known by more, they have to have a good energy. No mass tourism. To be honest, Mount Maapee and our second favourite spot were fighting for the stage. We tend to like Maapee more, because it’s less known so fewer people around. It’s also a bit of a challenge to hike up, which is fun. If the weather is good and you don’t suffer from any physical difficulties, we recommend this sightseeing spot in Ishigaki. Although not a difficult hill to climb, it has some steep parts and it can be slippery after tropical rainfall. ♥Just going for the view, take the nearest entrance to go up in just 20 minutes. For a longer hike for about 50 minutes, take the lower entrance. ♥Read here about Maapee and other hiking trails. Kabira Bay is with its emerald ocean colours, lush green surroundings and calm Yaeyama atmosphere one of the most beautiful bays in the world. 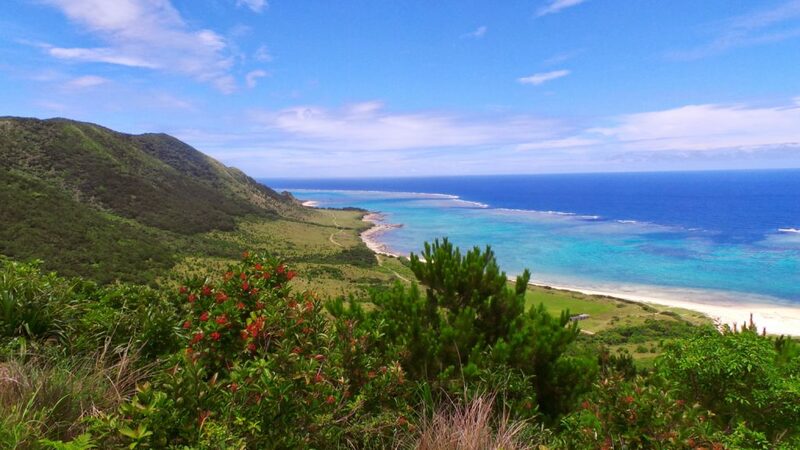 We can say with certainty, that everyone who travels to Ishigaki, visits this spot. It’s still not over crowded. Which we hope won’t change. Most of visitors arrive by tour bus and stay for a short while. ♥If you’re not keen on diving or snorkelling, which is highly recommended on the islands here though, you can try the glass bottom boats in Kabira Bay to have a glimpse of ocean life. ♥Stay a bit longer to breath local life in this small village and have lunch in one of the restaurants. ♥This is Yaeyama Instagram hotspot nr. 1. The shot Manabu took here was by drone. So the view you have will be from the cape itself, which won’t disappoint you. Resort hotel Club Med is close to this area. Follow the meandering road and surround yourself by beauty. ♥There is a lovely white sand beach next to the resort area of Club Med right in the middle of this peninsula. Good for a picknick or a stroll around. ♥Perfect spot for a beautiful sunset. ♥We would recommend to go here by bike if you like a challenge. To go up Akaishi mountain is an adventure itself. By car it’s a few minutes drive. First take the road through the gate which you have to open and close. Cows walk freely in this area so be careful, don’t forget to close the gate. They can suddenly show up on the road as well. ♥This is a lovely place to watch the sunrise. ♥Life in the Yaeyama is close to nature. Sunrises, sunsets, stargazing and the moon calendar are part of everyday life. On a small island, the ocean always near and strong nature among us, we see the tide going in and out by the changing moon. Farmers and fishermen follow the moon calendar and local festivals are planned by it. Because of less light pollution, stargazing is a wonderful fairylike and informative experience here. In western society we tend to forget the beauty of a sunrise or a sunset. The changing tides. We are busy to go to work, we don’t notice nature around us or within us. If you visit these islands, you will experience this close relationship with nature that we all once had. Maybe you will rediscover it. We recommend Yonehara beach, not only for the lovely beach itself. 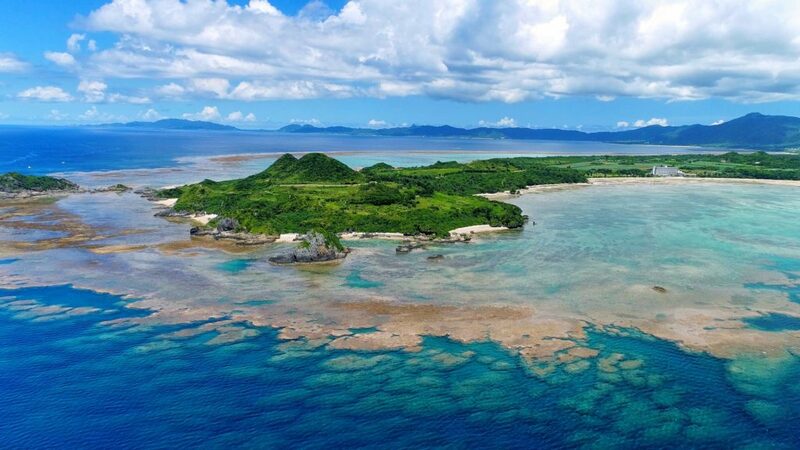 This is the best spot for easy snorkelling on Ishigaki island. With a few steps inside the ocean, even without swimming, you’ll discover so many colourful fishes. This beach isn’t protected so always be aware of possible dangers. Don’t go too far out, wear slippers or water shoes. Info about safety on beaches, read here. ♥Yonehara has a few lunch restaurants around. This spot is fun to visit for a morning or afternoon with lunch. ♥The bus stops in front.